Just signup once and sell your products right away. Books . Apparels. Handicrafts. Artwork. 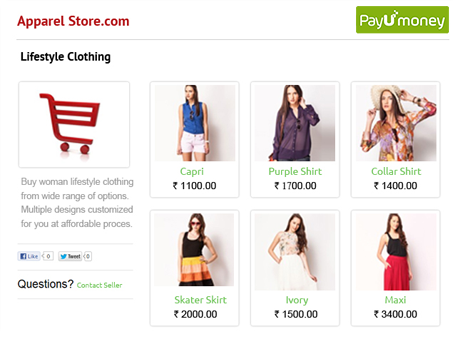 Design a free webstore using PayUMoney tools. Upload product images instantly and make your websore live in a single click. Start selling immediately..
Track your PayUMoney transactions from your dashboard and be updated on shipping details, transaction status, refunds and other information. Publish the url of your store on social media platforms like Facebook, Twitter, Google Plus and linkedin. Leverage social media to sell across the web in few minutes. © 2018 PayUMoney. All rights reserved.